This essay was first published as an appendix to a catalogue, Sir Daniel Wilson (1816–1992): Ambidextrous Polymath (Toronto, 2001), prepared by Robert Stacey for an exhibition at the University of Toronto Art Centre. See www.toronto.ca/artcentre for more publishing details. 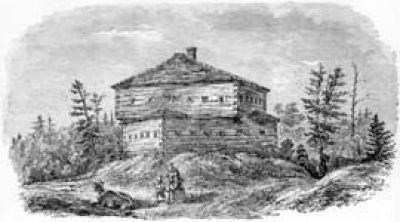 Glegg sketched the Yonge Street structure - the other two were identical - with its pyramidal roof surmounted by a single chimney. The upper storey sat diagonally on the lower one, a variation in design that allowed better surveillance in all directions but restricted the range of downward (or machicoulis) fire that could be aimed at attackers. From this brief enumeration, two questions emerge: why were so many of drawings of blockhouses done concurrently, and why were Brough's and Baigent's views so similar? The remarkable number of drawings done circa 1860 is not likely coincidental. One explanation for it may be the wave of nostalgia for log or timber buildings that gathered force as they began to disappear from the landscape in the U.S. and Canada. Baigent and Perré, both newly arrived in Canada, were likely fascinated by the romantic appearance and defensive role of the blockhouses. The beguiling appearance of antiquity of the Sherbourne Street building could have stirred in Daniel Wilson the same feelings that had given rise to his Memorials of Edinburgh in the olden time. Besides, since 1854 he had lived on the corner of Bloor Street and Huntley, only a short block away. 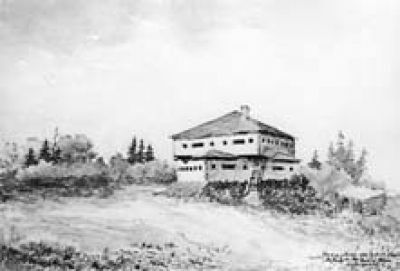 Of his four sketches, three are much alike and were done from a position south of the blockhouse in front of the home of Prof. Jacob Hirschfelder, his neighbour and colleague at the University of Toronto. The fourth sketch shows the building from below, perched high above the Rosedale Valley. 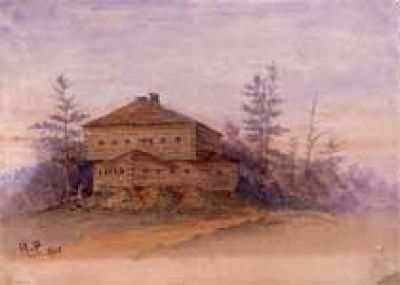 Another reason for the rash of interest in blockhouses may have been the anxiety felt in Canada following an incident in late 1861 when two Confederate diplomats were forcibly removed from the English mail packet Trent by the captain of an American warship, giving rise to considerable tension between Britain and the U.S. 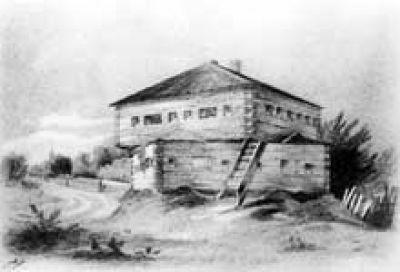 Although the blockhouses were poorly located in the event of an American attack, their existence may have been comforting as sabres were rattled, the militia were drilled and Fort York was strengthened. Or perhaps a straightforward explanation is more accurate: people in the city had warning of the impending demolition of the last two blockhouses and simply wanted to record them while it was still possible. None of this speaks, however, to the remarkable resemblance between the views of the Sherbourne blockhouse by Brough and Baigent. Of the two artists, the latter was the more prominent. Richard Augustin Baigent (1828-1890) had been an assistant drawing master at Winchester College in England before he emigrated to Canada in mid-1862. Shortly after his arrival he announced to "the gentry of the city of Toronto and its vicinity" that he would give private lessons in "Drawing, Painting in Oil, Water Colours, Crayons, and Sketching from Nature. "(15) This brought attention to his work, and less than a year later he was chosen by a selection committee (of which Daniel Wilson was a member) to replace Stewart Westmacott as drawing master at Upper Canada College. (16) Besides teaching privately and at UCC, Baigent gave drawing classes at the Toronto Grammar School and under the auspices of the Toronto Mechanics' Institute. Elected a founding member of the Ontario Society of Artists in 1872, he was named an associate of the Royal Canadian Academy in 1880. 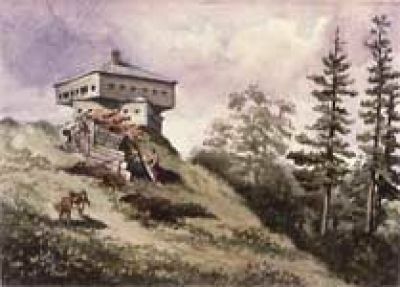 By comparison, Redmond John Brough (1846-1883) is unknown as an artist apart from his view of the blockhouse. (17) The eldest son of a leading lawyer in Toronto, he attended the Model Grammar School, was enrolled at UCC for the Fall term, 1863, and a few years later graduated from the University of Toronto. (18) At the time of his early death following a buggy accident, he was employed as City Engineer for Toronto. 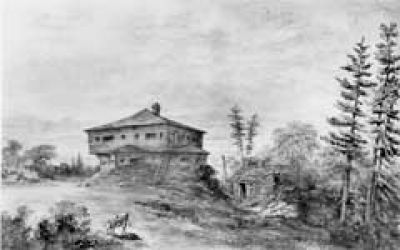 There is no doubt that Brough had remarkable talent for one so young - barely sixteen when he sketched the blockhouse - although he was probably not self-taught in developing his gift. 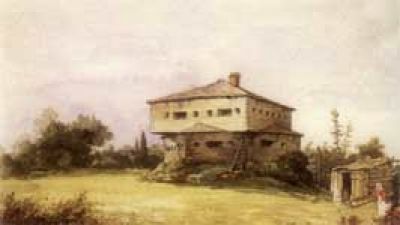 His watercolour is dated October, 1862, when he could have been taking lessons with Baigent and made the sketch under his supervision. This being the case, why is Baigent's view dated 1863, so similar? Coincidence is ruled out. It is possible - though unlikely - that the master copied the pupil's work. Or it may have been that Baigent had many of his pupils draw the blockhouse and he sketched alongside them. This suggestion is given some weight by the existence of the third, undated view of the building by a less-skilled, anonymous artist. (fig. 4) Worth considering too is that the date on either Brough's drawing or Baigent's may have been applied years later, perhaps by someone other than the artist, and was out by a year. The actual circumstances may have been obvious in November, 1863, when "some excellent specimens executed in water colours, by Mr. Richard Baigent and his pupils" were exhibited in the window of a store on King Street, Toronto. (19) This display prompted The Globe to observe that these "original drawings executed solely by the hands of his pupils . . . furnish the most satisfactory proof of the ability and success of Mr. Baigent as a teacher." Regrettably, a fuller description of the exhibit was not given. H. H. Langton, Sir Daniel Wilson, A Memoir (Toronto: Thomas Nelson & Sons, 1929), p. 68. NAC, RG8, v. 1635, pp. 1-9. Henry Scadding, Toronto of Old, ed. F. H. Armstrong (Toronto: Dundurn Press, 1987), p. 301. J. Ross Robertson, Landmarks of Toronto, v. 5 (Toronto: J. Ross Robertson, 1908), p. 336. Elmes Henderson, "Bloor Street, Toronto, and the Village of Yorkville in 1849," Ontario Historical Society Papers and Records (1930) p. 446. J. Ross Robertson, Landmarks of Toronto, v. 3 (Toronto: J. Ross Robertson,1898), p. 293. TRL, John Ross Robertson collection, 333 verso. J. Ross Robertson, Landmarks of Toronto, v. 5 (Toronto: J. Ross Robertson, 1908), p. 335. NAC, acc. 1989-514-115. Unknown copyist, Old Block House. Corner of Bloor and Sherbourne St. Toronto from a sketch by H. Perré 1863. Watercolour over pencil with pen and brown ink, 18.8 x 24.7 cm. The Globe [Toronto], 16 August 1862, 1. University of Toronto Archives, A74-018/6, pp. 68-9, Minutes of Committee on Upper Canada College, 1859-75. The Globe, 22 July 1883, 2. A. H. Young, ed., The Roll of Pupils of Upper Canada College, Toronto, January 1830 to June 1916 (Kingston: Hanson, Crozier and Edgar, 1917). The Globe, 17 Nov. 1863, 2.